Can 16MP and Full HD video recording make up for a noisy startup? Occupying the middle ground in the Olympus range of travel compact cameras, the SH-21 aims to be pocket-friendly, without compromising on features. A 16-megapixel backlit CMOS sensor promises superior performance at high ISO sensitivities, especially when compared to cameras using older CCD technology. This should be useful for taking images in a wide range of lighting conditions, especially when a camera support isn't appropriate. Up to ISO 3200 is available for shooting hand-held in low light, or for forcing higher shutter speeds to freeze action. The Olympus SH-21's 12.5x zoom range may seem a little modest when compared to the leviathan 24x zoom offerings in the Olympus travel camera range. Still, this reduced range keeps the camera to a svelte 30.6mm thick. The range covered by the zoom is equivalent to a 24-300mm lens on a 35mm camera, which should be plenty useful for everything from landscapes and architecture to wildlife you may see on your travels. Dual image stabilisation takes care of taming the effects of camera movement, which can be quite an issue on small cameras sporting telephoto optics such as this. A mechanical sensor-shift system steadies images when taking stills, and an electronic stabiliser takes over when shooting video. This is because the mechanical system makes a fair amount of noise, which may be disturbing on video recordings. As is the case with other current compact cameras from Olympus, iESP metering, advanced face detection and shadow adjustment technology have been included to aid accurate exposures in tricky lighting conditions. A 3-inch LCD screen provides a clear image for composing and reviewing images, due to its 460,000 dot resolution. Full HD video footage can be recorded with the Olympus SH-21 and output via the camera's HDMI interface on a compatible high definition television or monitor. Those with 3D TV equipment can also take and view three-dimensional images via the HDMI connection. Unfortunately to take advantage of this, you'll have to stump up for a separate HDMI cable. To aid in-camera creativity, without getting too technical, 10 'Magic' picture modes are included, which recreate a range of popular effects. Options from the common Pin Hole camera mode to the more exotic Punk mode, which creates a high-contrast pink and black image, are included for instant creative satisfaction. 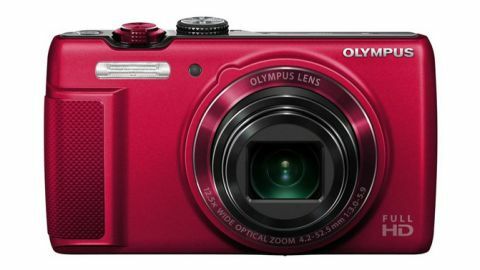 Priced at £189.99 in the UK, the Olympus SH-21 is in the same price bracket as the Olympus SZ-14, which was announced at the same time, and Canon IXUS 125 HS, Olympus SP-620UZ and Sony Cyber-Shot DSC-HX9V, to name a few.